Playing the violin requires that the arms and hands do very different tasks. We learn to do the tasks separately at first, but then work towards multitasking with each hand doing something different. The main developmental skills required to start violin lessons are the ability to use hands independently and to be able to be able to easily reach for something on the right side and bring it over to the left side and the reverse. Holding hands criss cross and squeezing with one hand and wiggling the other or patting the head and rubbing the tummy are tasks similar to what is required to play the violin. Very young children may find the violin supremely frustrating if their body isn’t ready to obey their commands! It is very useful for families to come check out what happens in group class and observe other students lessons. This way students are familiar with me and what violin lessons are and group class is like so they can be confident about what to expect when they begin. Ideally, especially for children under the age of 7, I like to start the parent before the child so that they learn a few tricks and can be the teacher at home. The parent comes to the first three lessons by themselves, then is ready to and confident about their ability to support home practice when the child starts. Parents need not have experience playing an instrument to be great partners in practice. At first lessons focus on building violin posture, working on the motion of the bow arm by “bowing” rhythms using the right hand on the left forearm, and playing games to learn the names and jobs of the fingers. 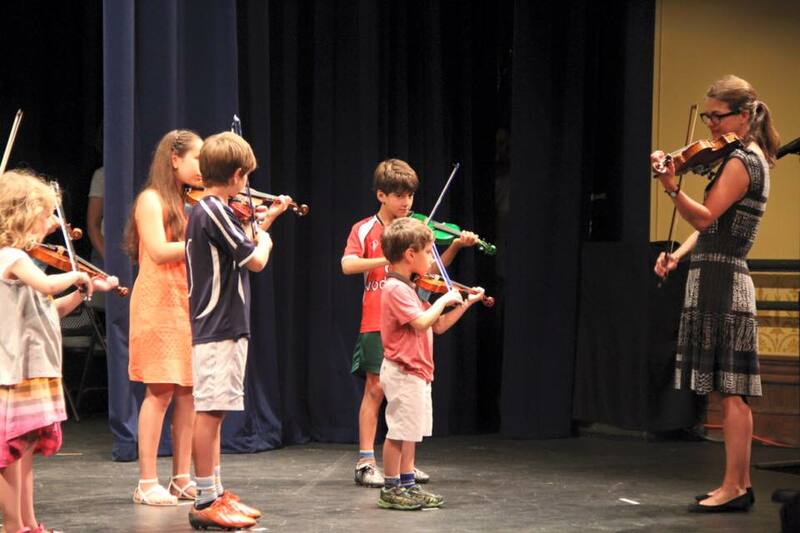 When children have “mastered” the bow arm movement, can easily form a bow hold with a pen, are comfortable bowing and have the foundation for good violin posture they then graduate to using a bow and later the violin and at some point the two together. I expect that activities introduced during lessons are practiced daily (just a few minutes at first- but every day) at home. The parent attends lessons so that they can can support the child’s home practice. Carving out time for practice and building a practice relationship with your child is part of the process of learning to play the violin. Play-based violin time while it sounds fun usually winds up with lots of creative solutions to undo which is highly frustrating for young children! Please don’t rent, borrow, or buy a violin for your child until they have mastered the basics and are actually ready to play it. Since you are thinking ahead towards violin lessons, it is a great time to start listening to the songs your child will learn to play. Ideally songs students are listening to are currently played or will be played a year from now. Daily listening to the songs is part of the practice of learning the violin. Listening need not be always “active” listening. Listening can occur in the car, while dinner cooks, while playing legos, etc. A cd with the songs your child will be playing is included in the Suzuki Book one book.